Help, I can't hear the vocal! Waves Vocal Rider Plugin to the rescue. The biggest struggle in building the mix for the Ringling Bros. Out of This World tour was in figuring out how to get the Ringmaster’s vocal to cut through an already busy mix. At most times the arrangement included several other instruments competing for the mid-range where I needed the vocal to sit: electric guitar, horns, drums, and any number of synth patches. I initially thought the problem was that the microphone was moving around on the actor’s face, but the wireless tech assured me that it was stable and even started taping it to his face. 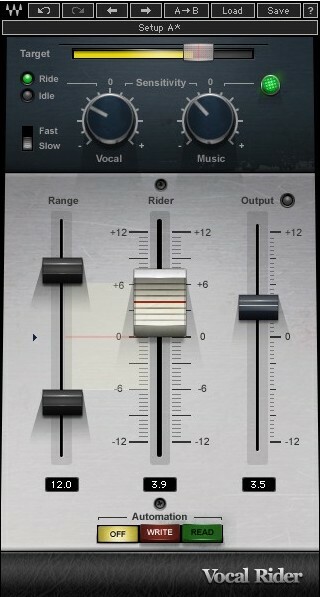 I then experimented with some different EQ and FX settings on the Digico SD5 before I landed on the Vocal Rider plugin. I had to jump through a few hoops to get it setup properly, but it was worth it. Why? Because it follows the music to adapt its volume changes. I used a buss of the entire band in the side-chain. That way, if the music was quiet, it would scale back its effect. No need for heroics. But if the music was loud, it would scale up. It was a big help with the challenging task of trying to combine a very dynamic lead vocal with a busy arrangement. Hey Nathan, thanks for sharing. You know the trick you tried using to pull all the instruments down – I’ve had success using Waves F6. Set a band to reduce, set the threshold really low (so any vocal in the external side chain triggers it) and set the gain reduction fairly low (like just a couple dB). This will pull down the music irrespective of how loud the vocal is. In a live setting that could be tricky if there’s a lot of bleed into the vocal signal but I suggest giving it a try. Great tip! And you’re right, if there’s a lot of band in the vocal, that will be tricky. Hmmm, what about an optogate connected to the sidechain somehow? BTW, what frequencies are you cutting with the F6?